Poppy and Harry - Where to begin! Poppy and Harry decided that they'd have a very small and intimate wedding at Malvern Register Office with around 10 guests made up of immediate family. Poppy said that she'd always dreamed of getting married under an oak tree, so the following week, with the legal ceremony out of the way, that's exactly what they did. Poppy and Harry hired Rock Village Hall in Bewdley for their wedding part II and their formal reception with a much bigger crowd than the wedding a week previous. They transformed Rock Village Hall and it looked absolutely fantastic. For the morning of wedding II, Poppy had hired a small farm cottage for her and her bridesmaids to get ready in. The cottage was the perfect size and being so far from the beaten track, it made for a very peaceful location for bridal preparations. From there, they made the day even more personal by driving from the farm cottage to Rock Village Hall in an original Citroen 2CV that they had restored fully to it's original glory. The photo above is one of my favourite photos from Poppy and Harry's wedding. 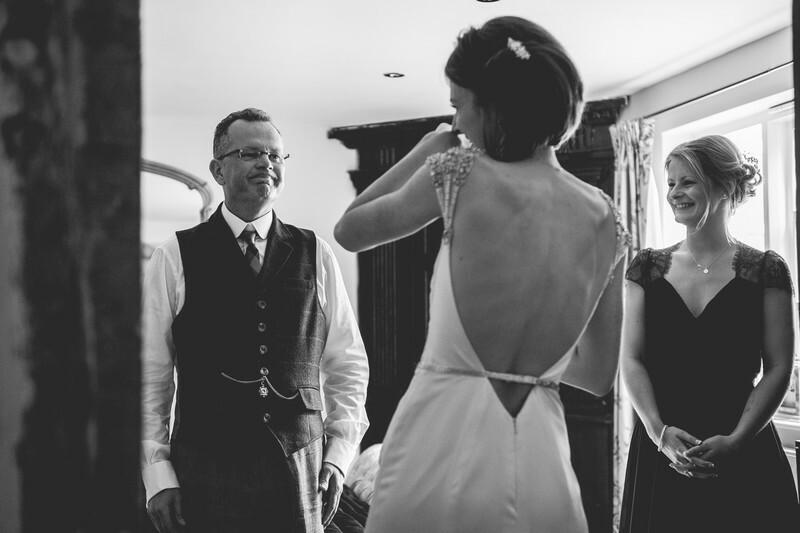 It shows the moment when Poppy's dad has seen his daughter in her wedding dress for the first time. This is where documentary wedding photography comes into it's own - you just can't tell a real story with emotion like this any other way.